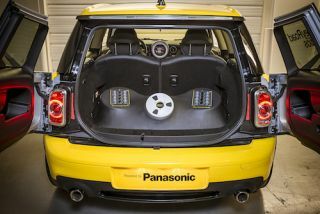 Panasonic and Abbey Road Studios create Mini Cooper in-car audio concept | What Hi-Fi? Panasonic and Abbey Road Studios have teamed up to create an eye-catching in-car audio concept, using a 2014 Mini Cooper Clubman S.
Inside the Abbey Road Studio Premium Audio Demonstration Vehicle are 12 Panasonic in-car speakers, and a 12-channel 580W amplifier. The demo vehicle also features two EMI TG12412 equalizers, designed and built by Abbey Road's in-house Record Engineering Development Department. The aim is to "recreate the unique sound characteristics present in recordings made at the studios". Users of the music streaming service Aupeo! can also listen to a selection of tracks produced at the studio over the years, through a dedicated "Abbey Road Studios Demo Channel" found on the service. The Panasonic-owned Aupeo! music service also announced a price-cut for new and current subscribers. The reduced rate is €2.99/month in Europe and $2.99 in the US, with 12-month subscriptions costing €29.99 and $29.99 respectively. Aupeo! also revealed it was working closely with DTS to create an in-car music streaming surround sound platform, using a new adaptive bitrate and DTS-HD to bring greater sound quality to in-car entartainment. The Abbey Road Studios Mini Cooper Clubman is on the show floor at CES 2014 so we'll be back with our first impressions very soon!